Surat: A petrol pump employee died in Surat city of Gujarat following explosion in the fire extinguisher device which he was trying to use to douse the fire in a two-wheeler which had come for refilling of fuel there. Police said that a bike suddenly caught fire at Mehta petrol pump situated near Chowk crossing in Athwa area last night. The father son duo on the bike left it and ran away. 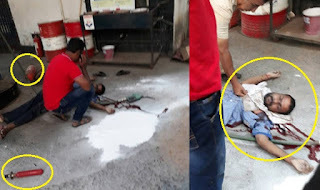 Rajkumar (42), a native of Uttar Pradesh, working as an employee of the petrol pump brought the fire extinguisher to douse the fire but while he was trying to open it, it suddenly blasted and its pin injured Rajkumar’s neck. Injured Rajkumar was admitted to hospital where he died late night. Rajkumar was hailing from Uttar Pradesh. Police was investigating the incident.